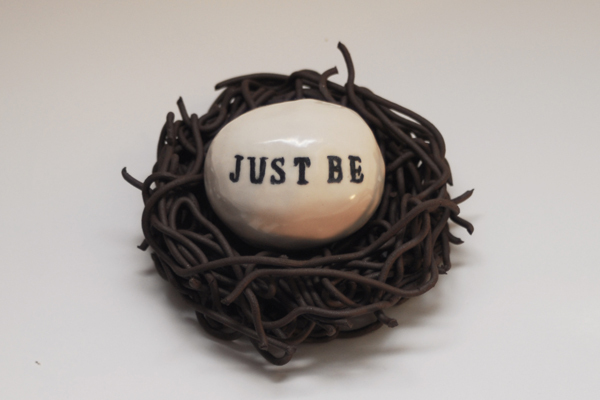 My good friend Heather introduced me to this phrase: “Just be.” She has an awesome blog about alternative therapies. Go check it out! I’ll be here when you get back. Back to “just being.” It took me a little while to really grasp what exactly that meant. I’m really good at nodding at people when they start talking about things I may not understand, this is true. I am even better, however, at nodding at things I want to understand. I was sitting on my front step, drinking my coffee, smoking my cigarette (bad girl!) and listening to the birds while feeling the wind on my face and watching the stars in the sky twinkle brighter than ever (stars seem their brightest between four am – five am). And then like a sparrow nearly smashing into my face it hit me. In that moment, on my step surrounded by nature, stars and cars in the parking lot… I was just being. My head was not racing with thoughts, deadlines, my kids, money or writing. I was just a body on the step with a blank mind enjoying my environment. How awesome is that? Let me tell you, it was so awesome that I try to “just be” at least 3-5 times a week now. And it helps. A lot. There is great peace and growth in just being. It is one of my favorite things to do. I love that! I do that a lot in the early morning too and have always called it ‘my time’…but I like “just be” better! I wish I were better at it! It’s really acharge when you suddenly find yourself…just being. I’m trying to figure out how to do this right now. I’ve had a few moments where I’ve reached that peace and being-ness, but they’re so fleeting, I can’t recall how to get there again. I hope that by trying at least a few times a day, I’m making it slowly learning the path . . .
I’m new to this as well, but have been working at mastering it. When I have obtained those moments, such as the one you mentioned–wow! My experience was when I was gardening (just started that this summer), and as soon I had all the flowers in their new planters/hanging baskets, a butterfly came. It landed on a flower in the one hanging pot, then on my shoulder where it sat for what felt like forever (time seemed to pause; I watched its wings open and close), and then it repeated the process, back to the flower, back to me. Throwing the frisbee for my dog to catch and bring back. This is wonderfully freeing, and fun, since my Aussie absolutely LOVES it! Pingback: Time Out « OhMyGawd, Just Do What I Say! I find that I practice this more as I get older. I’ve grown to appreciate those quiet moments and recognize their beauty. For me it often happens in the outdoors — while I’m on a hike or photographing a snail. Those are awesome moments to savor, but sometimes I find that “just be” moment in the very ordinary. Like a steaming cup of fresh coffee on a rainy Saturday morning. The moments are all around — if we take the time to notice. Thanks for sharing your thoughts, Diane. I love that you said “photographing a snail.” I haven’t seen a snail in ages! A steaming cup of coffee on a rainy Saturday morning (or a rainy Monday morning off) is the best! Great pictures, Diane! Thank you so much for sharing these… have a wonderful day. I am really bad at ‘just being’ but probably am most engaged in that when I’m walking. I multi-task way too much. I have a hard time as well, Joanna! I mutli-task a lot and it annoys me.. 😉 Thanks so much for stopping by! Always good to see you.